(1) EXPANSE FREAKOUT PREMATURE. James S. A. Corey says to settle down. Hey guys, love the enthusiasm, I really do, but maybe let us actually write season 3 before people lose their minds over 4th renewal. (2) DON’T BE SHOCKED. Jim C. Hines didn’t expect people to be surprised when he told them “Yes, I Still Get Rejections”. A while back, I posted something on Facebook about a rejection I’d received on a project. I was a bit taken aback when several people offered to “have a talk” with the editor. Others questioned the editor’s mental health for rejecting a Jim Hines story. It was flattering, in a way — I love that I have fans who are so enthusiastic about reading new stuff from me — but I think it might also reflect a basic misunderstanding. Rejections are part of the job. They don’t suddenly stop when you become more successful. They’re less frequent, yes. Much less frequent, and my own mental well being is unspeakably grateful for that. But with the possible exception of folks like Rowling and King, we all risk rejection when we write. Over the past year, I wrote a short story for an anthology that got cancelled. Another editor said they were interested, so I sent the story their way. They read it, said some nice things, and rejected the story. And they were right to do so…. (3) SF MUSEUM EXHIBIT. From June through August 2017, the Barbican Centre museum in London will present the exhibition Into The Unknown: A Journey Through Science Fiction, which is curated by historian and writer Patrick Gyger and will explore science fiction as an experimental genre. The Wire supplies the details in its article “A new Barbican exhibition will explore science fiction from a multidisciplinary angle”. It’ll include more than 200 books, original manuscripts and typescripts, contemporary and existing art works, 60 film and TV clips, unseen footage, adverts, concept art, film props, comics, video games and robots. Australian duo Soda_Jerk will present Astro Black, a two-channel video installation with a focus on Sun Ra’s theories of Afrofuturism and featuring footage of Kraftwerk, DJ Kool Herc, Afrika Bambaataa, Grandmaster Flash and Public Enemy. Plus Ben Frost and Daníel Bjarnason’s score inspired by Andrei Tarkovsky’s 1973 film Solaris will be performed with Poland’s Sinfonietta Cracovia, plus video accompaniment by Brian Eno and Nick Robertson. (4) THIS IS SO WRONG. “Firm Floats Plan to Hang Colossal Skyscraper From an Asteroid” – NBC News has the story. Dubbed Analemma, the fanciful tower wouldn’t be built on the ground, but suspended in air by cables from an asteroid repositioned into geosynchronous Earth orbit just for the purpose. Over the course of each day, the floating skyscraper would trace a figure-eight path over our planet’s surface, according to plans posted online by Clouds Architecture Office. It would swing between the northern and southern hemispheres, returning to the same point once every 24 hours. The speed of the tower relative to the ground would vary depending upon which part of the figure eight it was tracing, with the slowest speeds at the top and bottom of each loop, the plans say. The asteroid’s orbit would be calibrated so that the slowest part of the tower’s path would occur over New York City. …Analemma would be powered by solar panels and use recycled water. Lower floors would be set aside for business use, while sleeping quarters would be sited about two-thirds of the way up. The plans don’t say exactly how people would get on and off the building, though one illustration seem to show people parachuting from the tower to the ground. (5) EXTENDED FAMILY. Lightspeed Magazine’s Christian A. Coleman interviewed Nnedi Okorafor. You wrote in the acknowledgments of Binti that your daughter, Anyaugo, essentially came up with the plot of the novella. Was she also involved in plotting Binti: Home? We live with my characters. (6) GRRM AND LIBRARIANS. StokerCon is coming up April 27-30 aboard the Queen Mary in Long Beach, CA. George R.R. 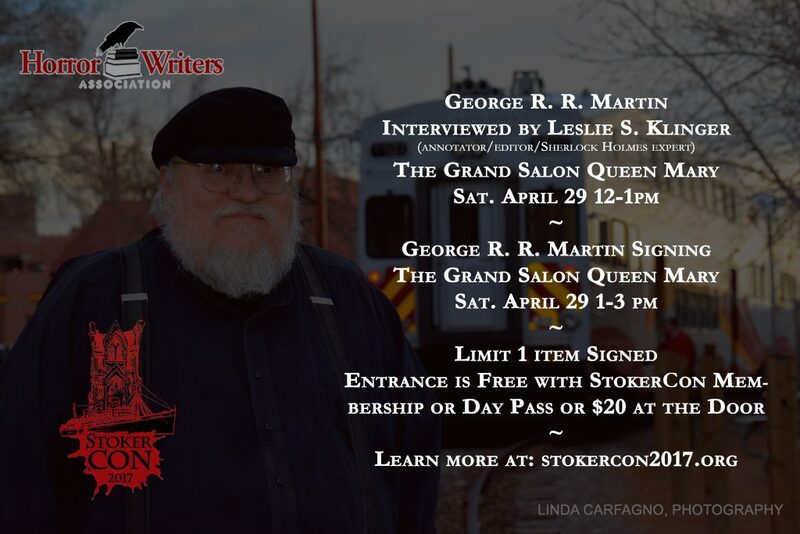 Martin will be there on Saturday for an interview and signing. 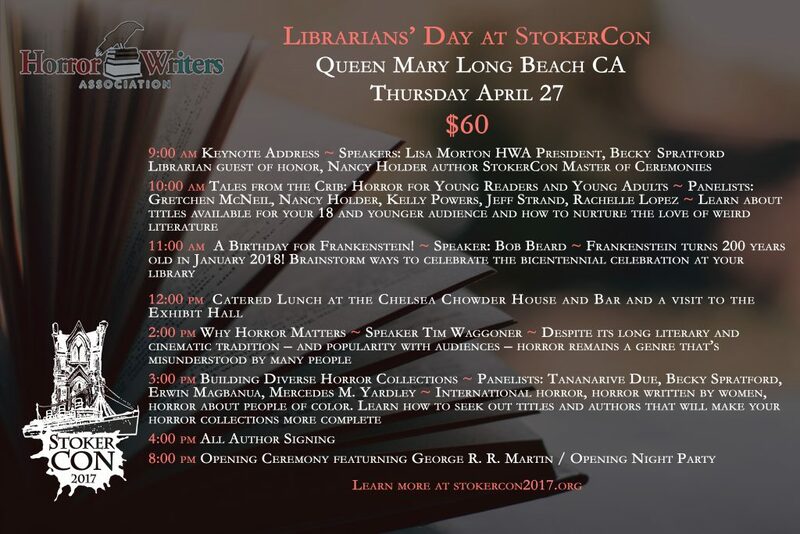 HWA is sponsoring Librarians’ Day at StokerCon 2017 – which is essentially a day pass for Thursday of StokerCon, as I haven’t seen anything requiring proof of being a librarian in the purchase information. (7) TUMMY TIME. “Karen Gillan’s ‘Jumanji: Welcome to the Jungle’ Costume Explained, but Does the Reason Make It Okay?” Yahoo! Movies ponders the answer. When the first footage of the film was released during CinemaCon, the reason for her ensemble was revealed. The plot involves four high-school students who are forced to clean out the basement of their school while in detention. They find an old video game (rather than a board game like in the version of the movie starring Robin Williams) and each chooses a character to play. The teenagers become the characters they selected, leading a nerdy boy to become The Rock’s character and a popular girl to become Jack Black‘s character. A more shy, reserved teenage girl ends up becoming Karen Gillan‘s character. The video game is old and dusty, so presumably the reason that she is dressed in tiny clothing is because that’s how female video game characters used to be dressed. Is that enough of a reason for a movie to dress the character this way? 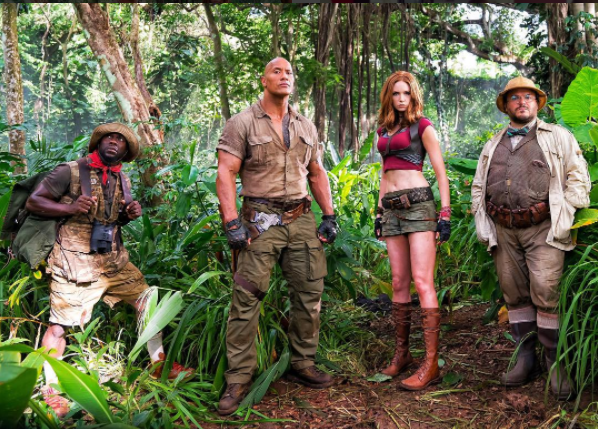 Should the objectification of the female lead in the movie become permissible because Jumanji: Welcome to the Jungle’s film creators wanted to be hyper-accurate to old video games? Does the fear of being anachronistic by giving Gillan pants or a fully formed top justify the male gaze? Do the critics who hated Gillan’s outfit feel soothed by this explanation? (8) DON’T SOUND SO SURPRISED. Io9’s take is “The First Footage From Jumanji Is Surprisingly Very Fun”. …They realize that, because they are in a video game, they each have video game powers. For example, Johnson’s character is super strong and Gillan’s character is a dance fighter, which they joke about. And also, she very quickly acknowledges how ridiculous it is that the game makes her outfit so skimpy. A kind of guide character tells them they have to place a jewel back into a statue to leave—but as they progress, the challenges get greater and greater. Killer animals, evil men on motorcycles, just lots of crazy stuff. And, like a video game, they each have three lives. If they lose those, they die for real. (10) IN GREAT DEMAND. James A. Owen’s seven-day Kickstarter to publish an Inklings Art Print Set hit 200% of its goal on Day One. These involve the illustrations he produced for Bandersnatch by Diana Pavlac Glyer. Not only can you see the drawings of the individual Inklings at the Kickstarter site, several are matched with photos of scholars and fans who visited to the English locations and recreated the authors’ poses, which I found highly amusing. (11)THE TRICORDER HAS ARRIVED. And in more than one version. 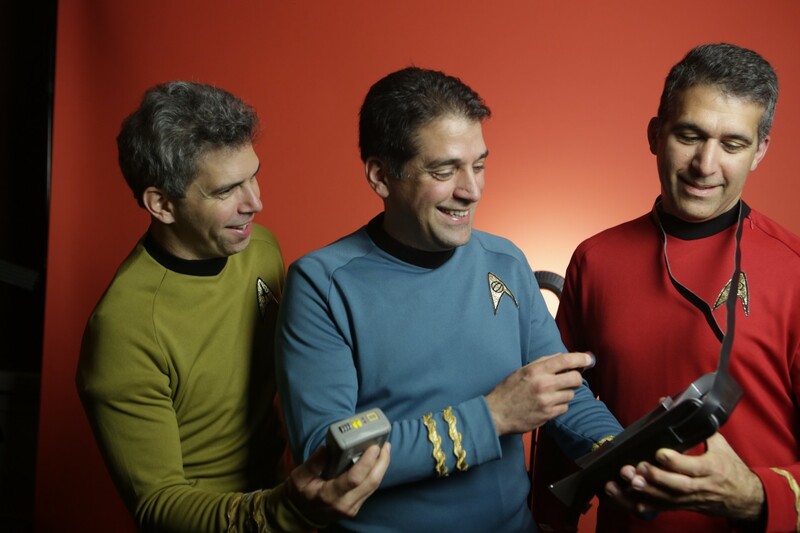 The Washington Post’s Karen Heller, in “This ‘Star Trek’-inspired gizmo could win its inventors $9 million”, profiles George, Basil, and Gus Harris, who are hoping to win a prize of up to $9 million from the Qualcomm Foundation for producing the first successful “tricorder”–defined as a hand-held medical device that could detect blood pressure, diabetes, anemia, and nine other conditions. The rules are that this device has to weigh less than five pounds and can be mass-produced. … Harris assembled a seven-member team — himself, three of his siblings and three friends — all of whom were managing full-time jobs. They worked nights and weekends in his home outside Philadelphia, crashed after 72-hour engineering marathons, churned out prototype after prototype on three 3-D printers in Harris’s jumble of an office, each plastic part taking up to 24 hours to fabricate and with his three children, ages 11 to 15, often overseeing sanding and wiring. The XPrize field began with 312 teams from 38 countries. Now, improbably, Harris’s group is one of two finalists for the $9 million prize. The winner is scheduled to be announced April 12. Harris’s competition is Dynamical Biomarkers Group, as formidable as its name: a group of 50 physicians, scientists and programmers, many of them paid for their work, led by Harvard Medical School professor C.K. Peng, a physicist with a 29-page résumé, and backed by the Taiwanese cellphone leviathan HTC and the Taiwanese government. So, this is basically a Basil and Goliath story…. (12) LUCAS INCREASES SCHOLARSHIPS. Liz Calvario on Deadline.com, in a piece called “George Lucas Family Foundation Donates An Additional $10M to USC in Support of Student Diversity”, reports that the George Lucas Family Fund has donated $10 million to the USC School of Cinematic Arts for scholarships for African-American and Hispanic students. The George Lucas Family Foundation has donated an additional $10 million to USC’s School of Cinematic Arts, expanding its support of student diversity, announced Dean Elizabeth M. Daley. The new endowment raises the Foundation’s total donation to $20 million. Established in the fall 2016 semester with an initial $10 million, the George Lucas Family Foundation Endowed Student Support Fund for Diversity was created for students from underrepresented communities who qualify for financial support. African American and Hispanic students in both undergraduate and graduate programs receive priority consideration for support from the Fund. Students are known as George Lucas Scholars or Mellody Hobson Scholars…. (13) IT MUST GO OFF. The File 770 comments section yielded an item for the Wordspy newsletter. (14) SHORT NOTE TO L.D. COLTER. The Michael Glyer who’s on Twitter is not me. I don’t have a Twitter account because occasionally I’d fly off the handle and tweet something dumb and there it would be for the rest of time. The other Michael Glyer doesn’t appear to have that problem. So there could be worse things than me being mistaken for him. (15) LOVECRAFT IN NEW MEXICO. As the locals say, it’s not new, and it’s not Mexico, H.P. Lovecraft of Ask Lovecraft visited George R.R. Martin in Santa Fe and recorded a couple segments of his vlog, which can be viewed at the link. Seeing HPL at Meow Wolf was especially fun, since there are a couple of… ahem… decidedly Lovecraftian touches to be found in the House of Eternal Return. If you ever get a chance to see Leeman Kessler perform as HPL, do catch him. It’s the next best thing to a shuggoth on your doorstep. (16) MARTIAN ODDITIES. FiveThirtyEight does both a statistical analysis and a historical survey of Mars in the annals of pop culture — “This Is Why We Love Stories About Mars”. Movies about aliens are getting more popular. Movies about Martians peaked a while ago. There is something poetic about Marvin being the referee in “Space Jam” in the game between the Tunes and the Aliens. After all, he’s a creature of both worlds. A 1960 episode of “The Twilight Zone” called “People Are Alike All Over” featured a Martian society that was just as indifferent and cruel as humans on Earth. The episode “Will the Real Martian Please Stand Up” played into the anyone-could-be-the-enemy-spy fears of the early 1960s, with invaders posing as humans to begin their infiltration. In comic books, Martians are — with one notable exception — the baddies. Martians who show up in a Marvel comic are sure to be villains. Sometimes they’re Nazis dressed up as Martians to scare New York. Either way, these comics are stories about external threats made real, conquerors, spies, warlords and assorted monsters of the week. In DC Comics, the White Martians are boilerplate invader types, as are Yellow Martians and the original Burning Martians. Only the Green Martians, of which there remains one — the Martian Manhunter — aren’t out for Earthling blood, despite their ridiculous power. In the contemporary era, humans dealing with Martians are occupiers, not collaborators. It rarely goes well…. This entry was posted in Pixel Scroll and tagged Darren Garrison, George Lucas, George R. R. Martin, Horror Writers Association, James S.A. Corey, Jumanji, Karen Gillan, Lovecraft, Mars, Nnedi Okorafor, Ray Bradbury, Star Trek, StokerCon, The Expanse, tricorder by Mike Glyer. Bookmark the permalink. Central heating is a standard feature there, I hear. Hampus Eckerman say 4) This is the future that liberals want. Huh? How so? This doesn’t to have a political bent to it, but it’s definately a technophile’s dream. It’s something that Larry Niven and the like would make use of as he did in Rainbow Mars. (The first place I saw ‘technophiles’ was Emma Bull’s 1993 novel, Bone Dance which had the subtitle of ‘A fantasy for technophiles’. Keith, you refer tp these episodes as Star Trek The Original Series Rewatch but they’re not part of Star Trek TOS. So why list them that way? airboy: Scholarships for POC =/= “scholarships for white people are bad”. At MOST it = “I’m deciding to focus on this one issue specifically.” Which is perfectly fine. Nobody expects an optometrist’s focus on eyes to mean they think other body parts don’t deserve medical attention. I went in last week and thanked the optometrist for finding my seriously high blood pressure, back in mid-December. Because it’s good to have it under control. rcade: Mike: The RSS feed for File 770 currently shows excerpts from each blog post instead of the full text. Have you considered a change to this policy? I read comments in the Feedly RSS reader a lot of the time and would find it convenient to read the entire blog there as well. I think this is controlled in WordPress by going to Settings, Reading in the admin dashboard. That’s an intentional decision. I found there were multiple sf/f blogs taking my feed (and others’) and reposting it without attribution as the content for their sites. @Standback: Yeah, the print quality on Analog and Asimov’s has been bad for some years. The covers are about up there with weekly magazines. My copies of F&SF even have adjustable print and pop-up word definition (for mundane words, anyhow). 🙂 But I got some free paper ones last year and the covers were sturdy, pages were thick, print was even. @PJ Evans: My dentist found a sinus infection once. George Lucas holds the terribly controversial and crazy left-wing opinions that slavery is bad, Nazis are bad, war is unpleasant, and he’s not keen on abstract art. Meanwhile, capitalism been bery bery good to him, and he can do whatever the hell he wants with the millions he earned as a guy who started his own businesses. USC is a completely private college, which means it costs a bunch (thus the joke about the acronym standing for “University of Spoiled Children”) so I say huzzah to getting more people who aren’t fratbro legacies in there. lurkertype: USC is a completely private college, which means it costs a bunch (thus the joke about the acronym standing for “University of Spoiled Children”) so I say huzzah to getting more people who aren’t fratbro legacies in there. I went there four years with a chunk paid by a California state scholarship. Met Bob Gale who was in the film school then, and took me to the first LASFS event I ever attended. Never belonged to a fraternity. From what I’ve heard over the years I think USC students did about the same level of shenanigans as anywhere else. But I remember discovering some dorm vandalism (somebody punched out the little window in the elevator door) and the trail of blood to the obvious suspect’s door, and when that came to a dorm disciplinary hearing the student involved brought his lawyer. There’s privilege for ya. @ Lenora Rose: This is a common error, and is basically an Excluded Middle fallacy. Organs, organs, organs. Won’t somebody speak up for the poor, oppressed pianos?